Both boys had Monday off to celebrate MLK day, so no lunches. 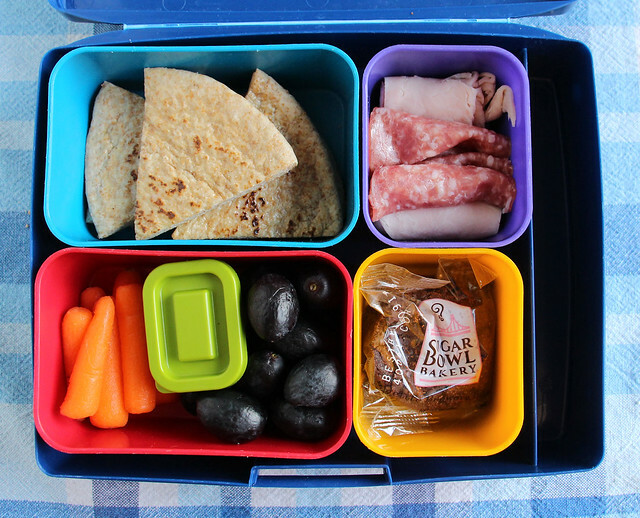 On Tuesday, Wyatt had garlic pita triangles, the last of the salami, the last of the turkey, a delectable brownie sample I brought home from the Fancy Food Show, grapes, black bean dip and carrots. This was packed in a Laptop Lunches box. Aaaaaaand…this is what came home. 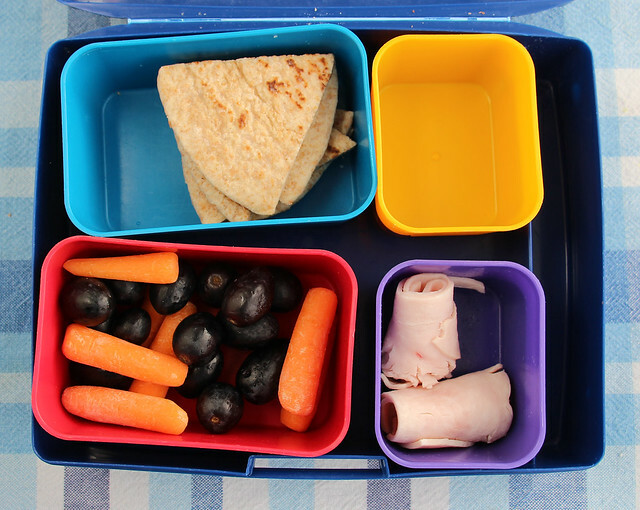 In case you were wondering, no — my kids don’t always eat their lunches. Sometimes they do, but they leave all the healthy stuff just as often. I usually make them eat it for their after school snack. 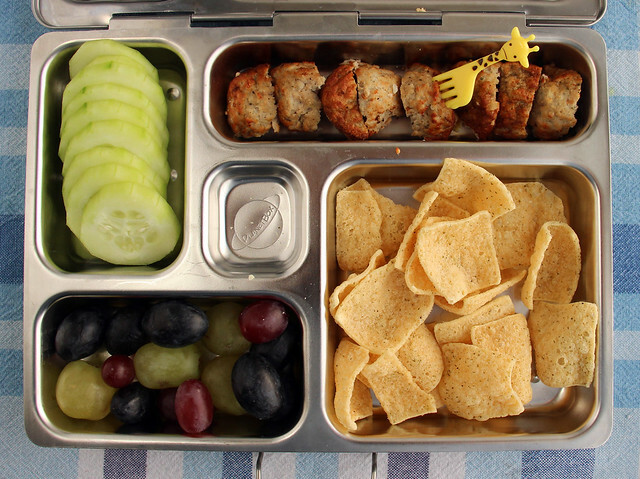 Augie’s lunch was packed in the PlanetBox: cucumber slices, turkey meatballs (plus a grumpy giraffe fork to eat them with), Plentils chips (another Fancy Food Show sample) and grapes. When we were at Trader Joe’s buying groceries Tuesday afternoon, Augie sampled some prosciutto and fell in love. Sweet! I bought a package as a treat and he asked for some in his lunch first thing when he got up on Wednesday. 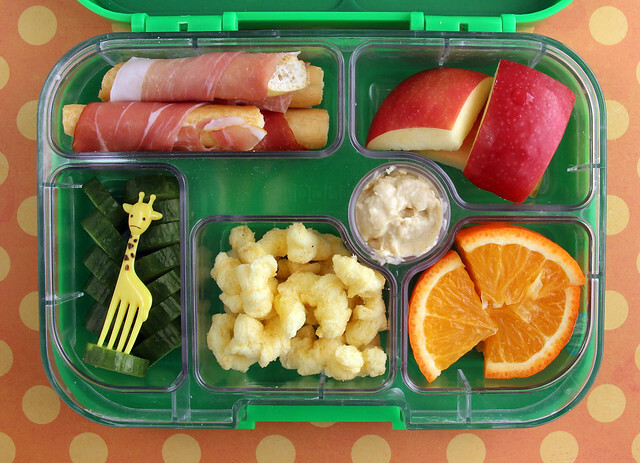 I wrapped a few thin strips around some breadsticks and put it in the Yumbox along with apple chunks, tangerine wedges, Cosmo Creations puffed corn (yet another sample), Persian cucumber slices (with our friend the grumpy giraffe to help with dipping) and hummus. 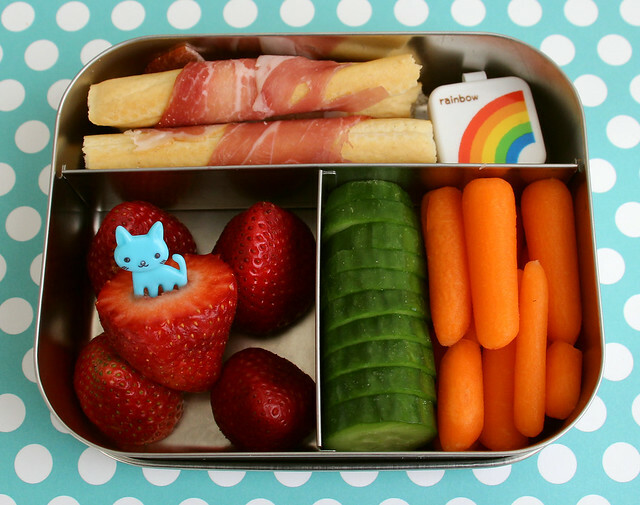 Augie had the prosciutto-breadstick thingies, hummus (in the rainbow box), strawberries with a cat pick, Persian cukes and carrots. This was packed in our LunchBots Trio. Today, both boys took leftover spaghetti and meat sauce in a thermal jar. 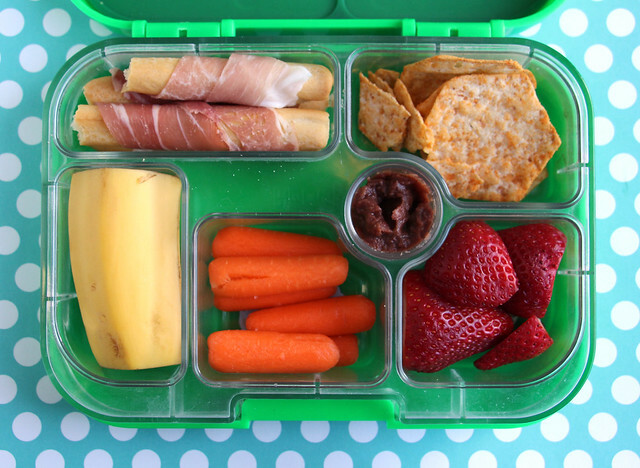 Wyatt’s was packed in our LunchBots jar along with a sidecar box filled with a half banana and some dried cranberries. 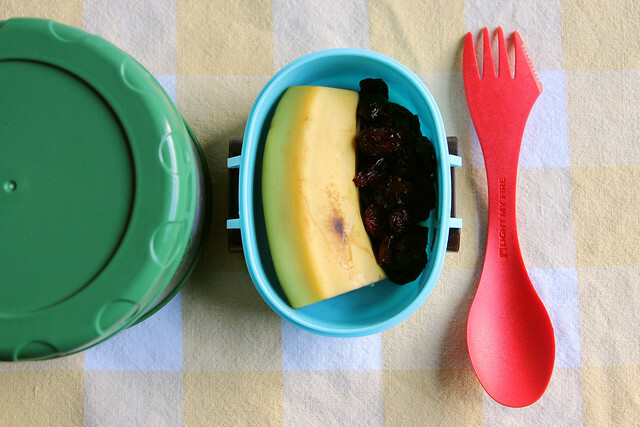 I also gave him his favorite lunchbox fork-knife-spoon combo — a freebie my husband brought home from a conference. Augie’s spaghetti went in our Thermos Food Jar . 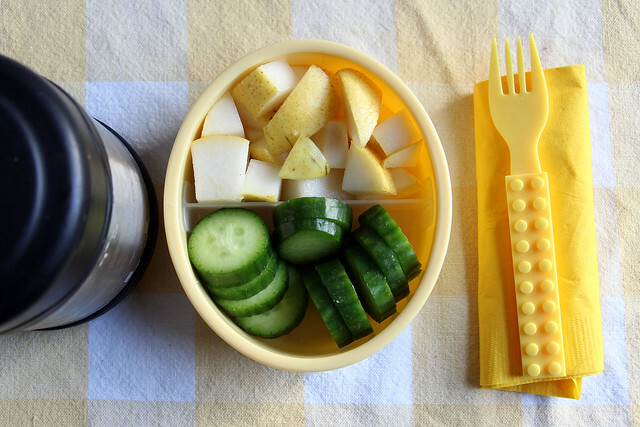 His sidecar had pear and Persian cucumbers and his fork was of the Lego persuasion.